Mushroom Briyani, jotted the recipe down from a cookery show by Mallika Badrinath and I have been making this for so many years now. 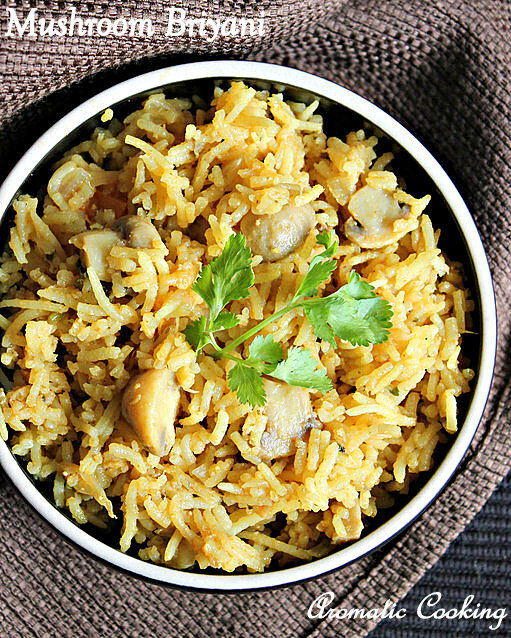 It's an easy dish and the mushrooms give a nice flavor to this briyani. We don't add any ghee in this briyani, so it's vegan too, the method is slightly different from the regular briyani and it tastes awesome. Serve it with some potato chips and raitha or curd for a delicious meal..
Wash and soak the rice for 20 to 30 minutes. In the meantime, pound the small onions, ginger and garlic into a coarse mixture and keep. Grind the mint leaves, 1 tablespoon coriander leaves and green chilly into a paste and keep. Grind the cashews and poppy seeds and keep. Wash and chop the mushrooms, slice the onion and tomato and keep. Heat some oil, add the bay leaf, cinnamon, cloves, marathi moggu, cardamom and star aniseed, when they start sizzling, add the sliced onions and the coarse onion-garlic-ginger mixture and saute for 2 minutes, till you get a nice smell. Add the tomatoes and saute for 2 minutes. Then add the mushrooms, mint paste, turmeric powder, chilly powder and garam masala powder and mix for 3 to 4 minutes. Then add the cashew paste and curd and mix for 3 minutes. Now add the drained rice and mix for another 2 minutes. Add 2 and 1/2 cups of water and salt, cover and cook, once it starts boiling, reduce the heat and cook till the rice is done and there is no more water. Add the remaining 2 tablespoons of coriander leaves, cover, switch off and don't disturb the rice for at least 10 to 15 minutes. Follow the order in which I have added the ingredients. Don't mix the cooked briyani, when it's still hot, that will break the rice. You can reduce the water by another 1/4 cup, if you like the rice very al dente, we like it like this. I have cooked in a regular pan, you can use the pressure cooker, after 1 whistle, reduce the heat to the lowest ( only a small flame in the center) and cook for another 5 minutes and switch off. You can also add a cup of fresh or frozen green peas along with the mushrooms. As always, very delicious, Hema. 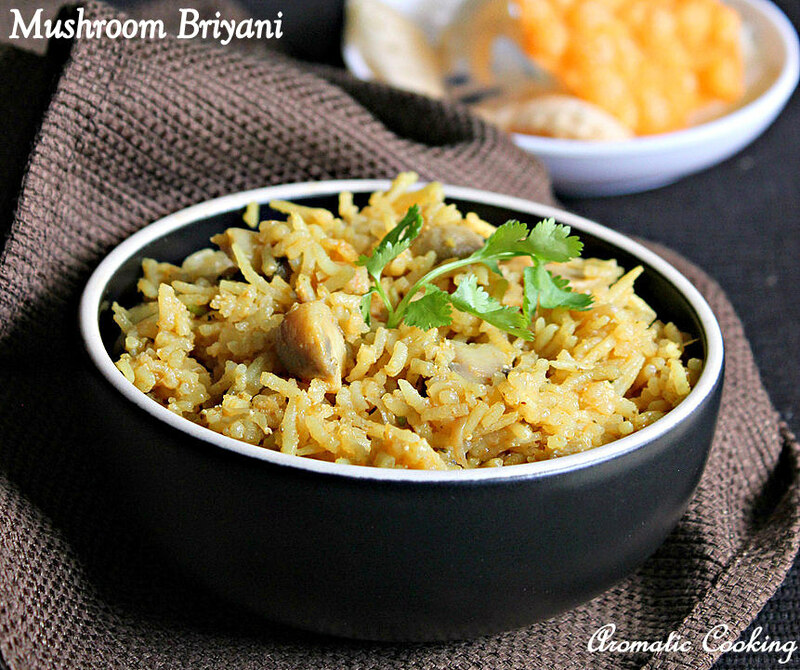 I love this flavorful biryani!